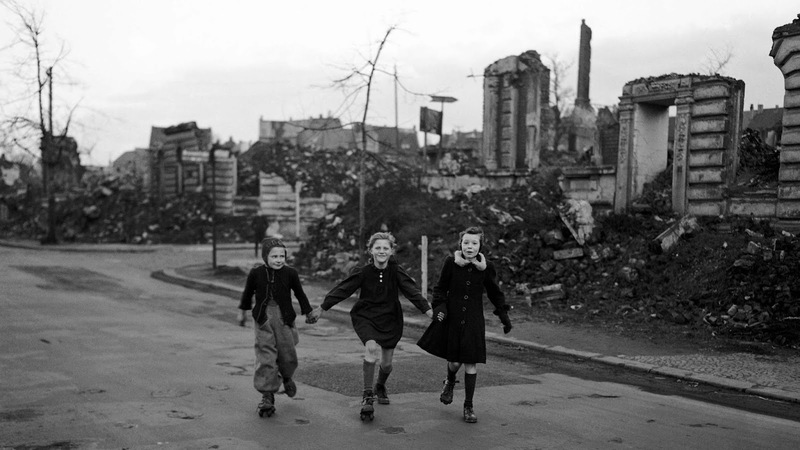 Three German girls skate home from school past blocks of houses destroyed by Allied air raids in Essen, Germany, Feb. 14, 1949. These kids can’t remember a time when their city didn’t look like that, because they weren’t old enough or even born when the city was still standing. For them, life had always been like that. Interesting how two of the girls are sharing one pair of skates. Factories weren’t churning out kids toys; they would have been producing war goods for some time and therefore probably targeted and destroyed. Even for sometime after the war raw materials weren’t easy to get as it would be prioritized for other projects for infrastructure and essential items, toy factories weren’t high on priority list. During World War II, the industrial town of Essen, especially the Krupp factory, was a target of Allied strategic bombing. One of the aims of war is to demoralize the enemy, so that peace or surrender becomes preferable to continuing the conflict. Strategic bombing has been used to this end. In the period 1939 to 1945 the Royal Air Force (RAF) dropped a total of 36,429 long tons of bombs on Essen. In the course of 272 air raids, 90 percent of Essen city center was destroyed, the remaining city area suffered 60 percent destruction. The phrase “terror bombing” entered the English lexicon towards the end of World War II and many strategic bombing campaigns and individual raids have been described as terror bombing by commentators and historians. Because the term has pejorative connotations, some, including the Allies of World War II, have preferred to use euphemisms such as “will to resist” and “morale bombings”. rubble had been removed. At least in my neighborhood in Berlin 20 blocks from the "bunker". Rollerskates was also my mode of transportation. These girls look to be just about my age, perhaps 3 years younger. When the Russian took over our neighborhood, I was 13 and I do remember what our city looked like before 1943.